"I am desperate to buy the correct plants/seeds to grow this year so I can use them for the table decorations at my sons wedding, at the end of September. I have said I will make the flower arrangements to save them (and me ) money. The reception is in an old barn and they are just having a hog roast but they would like some jars/bottles with a wild flower look/arranglement on the tables and they have said they want 36!!" So here's my ideas of what to grow if you're looking to fill jam jars for any table event. First, - if the wedding is in September, - phew, you've got plenty of time to plan. Don't start too early. You've got a month to 6 weeks before you need to be planting and seed sowing, so make sure that you've got your ideas and plans together. You can use the downtime to make sure you've got everything ordered, and know when and where to plant. Second - Make sure it's not just flowers that you're growing. - Every display needs fillers and foliage. Have you got shrubs growing in your garden that are suitable? - or will you need to grow those as well? I spent this morning creating a farewell flower sheaf. -It was made of a base of foliage - Bay, Pittosporum, Viburnum tinus, Rosemary and Sarcococca, plus Skimmia.- Through these I threaded Hesperantha from the field and Paperwhite Narsissus and tiny Anemones from the polytunnel. plus Lincolnshire Tulips and Spalding Hyacinths and Alstroemerias. It's something i've done quite a few times before, - but this time was different, as this was for a special lady who was a second mum to me through my teenage years. My Friday night TV watching last night was a lot better than normal. - Scented plants on The Great British Garden Revival, and then and hour of innuendo on the Allotment Challenge. (watch again by clicking on the links if you missed them) The featured flower for the Allotment was Larkspur, - and i'd been planting some out earlier yesterday on the field, - so here's my tips for getting excellent Larkspur, which is an Annual version of Delphiniums, this summer. Happy New Year to you all. I did manage to stay up to welcome in the New Year last night, - my head wasn't too sore this morning, and because we sorted all the Chrysanthemums the other day, - we had room to plant out the Autumn Sown Sweet peas today. Having a polytunnel, means that I can get an early crop of Sweet peas, and that they don't get damaged by the rain. They are a high maintenance crop to grow. needing regular tieing in, feeding, watering and picking, - so although they've been really popular with my florists and in my bouquets over the last 2 years, they havn't been very profitable for me. - This year i'm determined that will change, and so i've done lots of planning so that this fantastically scented crop will give me blooms between late May and late July. i've very conveniently got some security fencing on my farm, so that is used each season as a great sweet pea support, and the centre of the polytunnel becomes a whole aisle of fragrant blossom. Today, we were planting out the October and November sown seeds. The first tray of plugs was the Winter sunshine varieties.- I've planted Opal, Light Blue, Lavender, and Cream. I saw these growing when I went to Rachel at Green and Gorgeous's Sweet pea Masterclass last year, and we were picking them from their polytunnel in abundance on 18th May. My 2nd tray of plugs which was sown on the 9th November, are varieties to follow on from those. - i've chosen Anniversary (pink) Turquiose Lagoon, Limelight and for pure scent, rather than length of stems - Matucana. When we got back home today, I then planted another tray which will be the first of my outside varieties, and will be planted out in March - Cream Southbourne, and Noel Sutton, (both great favourites from last year) plus Erewhon, and Eclipse, which have both come highly recommended to me. I've chosen shades of cream, pale pink mauve and blue, because that's what was in demand last year. These will be joined by more to be sown in Early March, and then another tray in April. - There are seeds of Limelight, Sir Jimmy Shand, Hero (more faves from last year), Noel Sutton, and a Spencer mixed to complete the year's crop. Any i've missed? what colours are you going for this season? 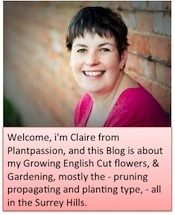 Rachel and Ash at Green and Gorgeous are leaders in the #britishflower movement and run wonderful courses at their flower farm, Rachel's blogs aren't as frequent as i'd like but everything she writes is worth reading. Ben has great how to guides, loads of pictures of seedlings and the best seed shop this side of Alpha Centuri!